To create experiential learning projects that educate and inspire individuals and communities to live sustainable, earth-centered lives, reconnecting people with each other and the planet, and empowering them to deepen their relationship with and understanding of the Earth. 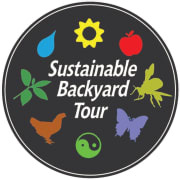 The Sustainable Backyard Network was established out of the Sustainable Backyard Tour which began as a simple 6-yard tour of chicken coops in 2010. Response to that simple open-yard Sunday was overwhelming. So great was the interest, that the owners of two independent retailers-a green general store called Home Eco and Isabee’s Beekeeping Supplies Co.-worked together to create the First Annual Sustainable Backyard Tour in 2011. The first tour featured 30 private residential yards throughout the city and county that showcased a variety of elements, from organic vegetable gardening to goat keeping! In 2012, with the help of volunteers, the tour expanded to include 54 stops and some 1300 registered guests. The tour has received great support from the community and the public every year since! In 2018, we registered The Sustainable Backyard Network as a non-profit to ensure a future for this grassroots voice of sustainability and resilient community building. With the community’s help, we plan to increase the educational benefits of the organization year 'round with ongoing classes, new programs and fun events like our August 2018 Shindig! Would you recommend SUSTAINABLE BACKYARD NETWORK?